Pain Description: Pain generating from the lower back and hips to the lower body. Multi-causal. Aim: To take pressure off the lower spine, hips and legs, and to keep the body supported in a healthy upright S-position (that’s the natural curve of our spine). This reduces and prevents pain and tension build up, to relieve sciatica symptoms. The designer suffered from repeated bouts of sciatica herself and created these chairs especially to help you. Recommended Chair Model: Either of our specialist chairs, the Libero or the Rituwell Star. These are our most adjustable chairs and can be set in the ideal position that helps relieve your back issues. Bespoke options are also available in these chair ranges, including an inflatable seat cushion. 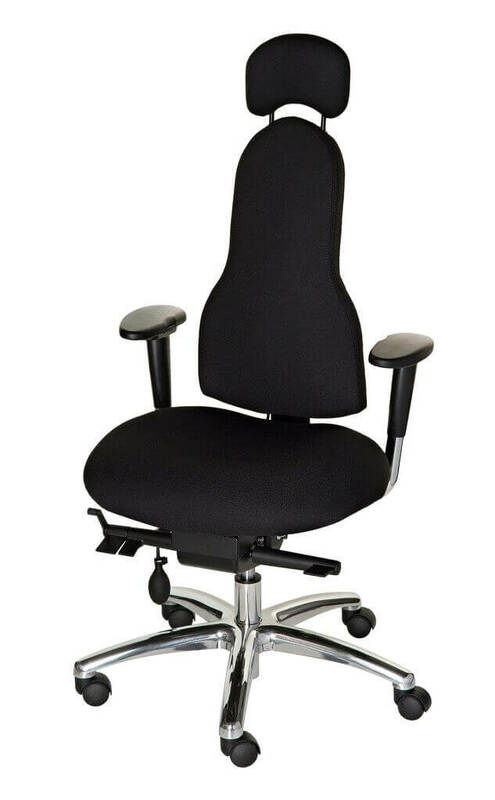 At Corrigo we offer a range of ergonomic chairs designed to deal with specific back problems. Our Libero or Rituwell Star specialist chairs for sciatica nerve problems is perfect for anyone suffering with sciatica, or for anyone with hip problems, including those who have had a hip replacement. We set out to make chairs to really help people suffering with back pain. It’s why we’ve designed chairs that are highly adjustable and incredibly supportive. You’ve probably already guessed, but we are passionate about posture and back health. All of our chairs have been designed by Nichola Adams, (MSc Ergonomics, Tech CIEHF), through years of research and collaboration with physiotherapists. We wanted to make chairs that not only help people to resolve their back pain, but also help to keep back problems at bay. Nichola suffered back issues in the past and was therefore personally able to ensure the chairs really did what they are designed to do! We not only offer well-designed products, we have an expert team on hand to make sure you make all of the right choices when you are buying your next office chair. If you want a chair for sciatica that will give you the right support, boost your recovery time, and help to prevent symptoms returning, at Corrigo we have the right chair for you. Contact us for a FREE consultation with our ergonomics expert to find the right support option for you at info@corrigo-design.com. Our Libero chair is the perfect choice for sciatica nerve problems. The Libero or Rituwell Star specialist chair is suitable for anyone suffering with lower back pain, but particularly if pain radiates from the back and/or hips into the lower limbs. Sciatic pain tends to radiate from the lower back into the buttocks, and can often also be felt down the back of the legs. These chairs have been designed to specifically help with this type of condition. You’ve probably already been advised by your health practitioner not to sit down for long periods. For healthy backs we endorse that view too. However, there is often a need (usually due to work) to sit at your desk for quite a few hours each day. That’s why we’ve made chairs to help you sit in the optimum position with the best support and the most comfort to enable your back to be supported in the best possible way. These specialist chairs are designed to take pressure off the lower back, the hips and the legs, and to keep the body in a healthy upright S-position (that’s the natural curve of our spine). Our Libero and Rituwell Star chairs not only promotes good posture, but it also helps to reduce and prevent pain, and helps to avert tension build up. Many chairs lack the adjustability required to offer the best back support. These chairs offers extensive adjustability to ensure maximum support. Every person is different and we’ve designed our chairs to recognise that. It’s why these ergonomic office chairs have a far higher level of adjustability than most other similar style chairs on the market. The key areas of support required for those suffering with sciatica nerve problems are the lumbar back, the upper back and the arms. Our Libero and Rituwell Star chairs are designed specifically to give you the best support in all of the areas known to be problematic for those experiencing sciatic nerve problems. We make chairs that are highly adjustable so that every chair can be set up to suit the individual who will be using it. The angle of your sitting posture is key in supporting a healthy, pain-free back. The high level of adjustability makes the Libero and Rituwell Star chair model perfect for sciatic nerve problems. You can adjust the backrest and seat angle to a setting that will maximise your recovery. Because of your sciatic or hip pain, you are more than likely holding tension in other areas of your back. It’s how our body compensates. Our specialist ergonomic chairs can be fine-tuned to your exact postural needs and provide the support you need exactly where you need it. Reducing the further build up of tension is key to your recovery. 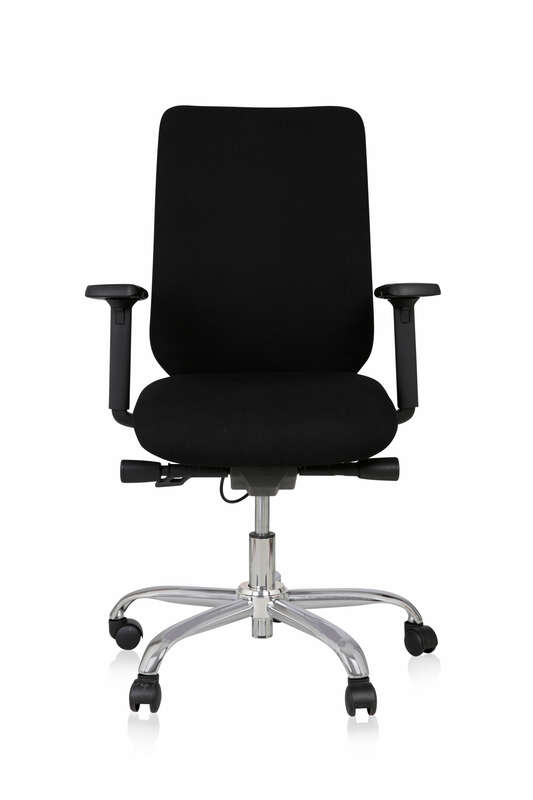 The slim backrest allows freedom of movement. It supports your upper back, but allows your chest to open, and helps to prevent slouching and tension build up. The inflatable, height adjustable lumbar support is integrated into the backrest and can be adjusted to support the base of your spine in a position of optimum comfort and support for you. The Libero and Rituwell Star’s extra cushioned seat supports the whole of your thighs without restricting blood supply. Importantly, the seat length is totally adjustable to suit your leg length. Correct seat length is imperative for a correct seating position in order to maximise the back support offered by the chair. The adjustable angle of the backrest enables you to find a seated position that relieves pressure on your hips. Do all of your chairs come in a standard size? No. Not only are our chairs individually adjustable, we understand that a standard sized chair won’t always be suitable for everyone. All of our chairs come in 4 different sizes. We just need to know your weight and your height and we’ll advise you on the right chair size for you. How easy is it to adjust the chair to my specific requirements? Easy. All of our chairs come with fitting instructions. We have a useful video guide on our website too, and one of our expert advisers can always talk you through the fitting instructions if you need any extra help, or we can arrange a visit to set up your chair as well as review your whole workstation set up. You are also welcome to come into our showroom for a free ergonomic assessment, and we will explain all of our adjustable chair settings to you. This is by appointment only, so please call us on 0203 475 4510 to arrange a suitable time. Do I need to continue using the chair once my sciatic nerve problems have resolved? Our Libero and Rituwell Star chairs won’t just help to relieve your sciatica symptoms, it will help to prevent them returning in the future. We’d recommend you use our specialist ergonomic chairs for life! What if I buy one of your chairs, but I don’t like it? Of course we want you to be completely happy with your Corrigo chair. That’s why we offer a 14-day no quibble money-back guarantee. Try one of our chairs for up to 14 days and if you really don’t like it, we’ll give you your money back. We’ve not had any complaints yet! Are your chairs under guarantee? All of our chairs are made to order in the UK. We use traditional high quality manufacturing methods to ensure all of our chairs are made to an exceptionally high standard. That’s why we offer a 5-year guarantee for standard office chair use. Do your chairs come in different fabrics? Yes. We not only want our chairs to provide you with the best support, we want them to look fabulous too. You can choose from a range of fabrics, including our standard breathable wool/nylon mix (80% wool, 20% nylon), felt wool, or leather. There is an additional charge for our felt wool and leather fabric options. If you have any questions we haven’t answered, please get in touch. If you are looking for a high quality chair for sciatica problems, our friendly expert team will be happy to guide you.